Russian thistle, Salsola tragus L., Salsola iberica Sennen, introduced from Russia, is a summer annual in the goosefoot family that reproduces by seed. Seedlings have long, threadlike leaves, resembling pine tree seedlings. It is a rounded, bushy, ulti-branched plant that can grow up to 4 feet tall and nearly as wide. Stems and branches often have reddish or purplish stripes. The numerous branches are slender and succulent when young, but woody at maturity. Leaves are alternate and linear; early leaves are dark green and fleshy, but as plants mature, leaves become short, stiff and spiny. Flowering occurs from midsummer to fall, when small, inconspicuous, pink to greenish flowers develop and are borne, usually singly, in leaf axils above small, leaf-like, spine-tipped bracts. Russian thistle plants break off at the base after maturity and tumble with the wind, scattering seeds over great distances. A single plant can produce 250,000 seeds, which typically remain viable for a year. Seeds are round, snail-shaped, and white to pinkish in color. 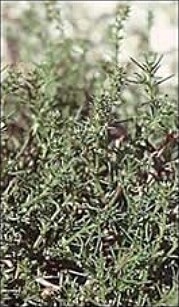 Russian thistle is commonly found in dryland fields, along roadsides and in disturbed areas. It can reduce yield and quality of crops. Despite the many downsides of Russian thistle, young plants can be used as livestock forage. Russian thistle actually provided a lifeline to beef cattle during the Dust Bowl era, when animals were starving due to a feed shortage. Mechanical: Mechanical strategies can be used to manage Russian thistle. Small infestations of young plants can be pulled or dug. Little can be done with mature plants, not only because of their large size and spiny nature, but because disturbance facilitates seed spread. Mowing is not effective unless repeated often for several years because plants tend to recover by sprouting new branches below the cutting level. 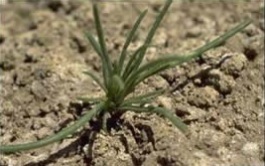 Ongoing intensive tillage that prevents seed production can control Russian thistle, particularly when combined with cultural practices, i.e., maintaining competitive vegetation. Chemical: Herbicides are available and are best applied at the seedling growth stage. Herbicide efficacy can be reduced by resistance (especially in the sulfonylurea and triazine herbicide families), or if applications are poorly incorporated or timed. Some herbicides that can provide effective control of Russian thistle in small grains are: chlorsulfuron+metsulfuron (Finesse®), metribuzin, metribuzin in combination with others, thifensulfuron+tribenuron (Harmony Extra®), tribenuron (Express®), 2,4-D, dicamba+2,4-D, bromoxynil with dicamba or MCPA or both, and pyrasulfotole and bromoxynil (Huskie®). Control will be dependent on many factors and should be applied when the plant is actively growing and small. under investigation. Cattle and sheep will graze young Russian thistle plants, but grazing alone does not provide control.